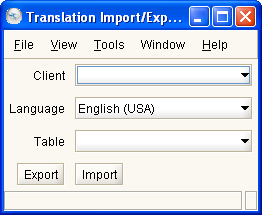 Help : Export/Import Translation info to/from xml for translation in external tool. Please note that the Language MUST be an enabled and verified System Langage. If you don't select any table, all tables will be exported/imported. This page was last modified on 17 September 2008, at 10:19.